What exactly did we achieve this week? Democracy Now! headlines (video posted above) AND an interview w/Billie tomorrow! TUNE IN! Truth-Out article and some good local coverage . . .
Do you have a few hours of time to help out? We could really use the help and have some clearly outlined volunteer tasks that can be accomplished within a few hours. 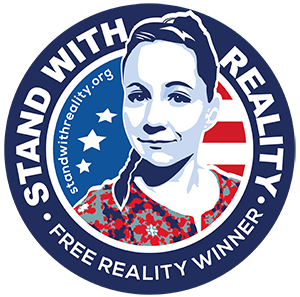 Check out our list of focused volunteer opportunities to #FreeRealityWinner such as simple online research. Join the team! Are we living in a trump dictatorship? This is an outrageous miscarriage of justice. Our system is dependent on whistleblowers. It was great to see Reality with the peace sign. The government can’t break her spirit, and it’s just killing them. I’m going to write Reality a letter right now and tell her I saw the video. It’s unjust that an honorably discharged veteran with no prior criminal record has repeatedly being denied bond. Our rule of law dictates that an individual be considered innocent until proven guilty, yet she has been denied her rights time and time again. Reality neither spied nor aided any foreign enemy, but because she is being charged under the Espionage Act, she is unable to access the usual avenues available in our justice system to defend herself. This is grossly unfair. She has been effectively segregated from the public and completely silenced. Every American should see this as an affront to our democracy.